The HDMI video switch routes digital video and audio signals from multiple HDMI sources to one HDMI display. The switch can be controlled via the front panel button or IR remote control. Eliminate duplicate purchases of expensive high definition displays. Supports crystal clear HDTV resolutions to 1080p and computer resolutions to 1920x1200 (WUXGA). SE-HD-3-LC: up to 65 ft (20 m) on the inputs and 82 ft (25 m) on the outputs. SE-HD-5-LC: up to 32 ft. (10 m) on inputs and 82 ft. (25 m) on outputs. Compliant with HDMI 1.3 and HDCP standards. 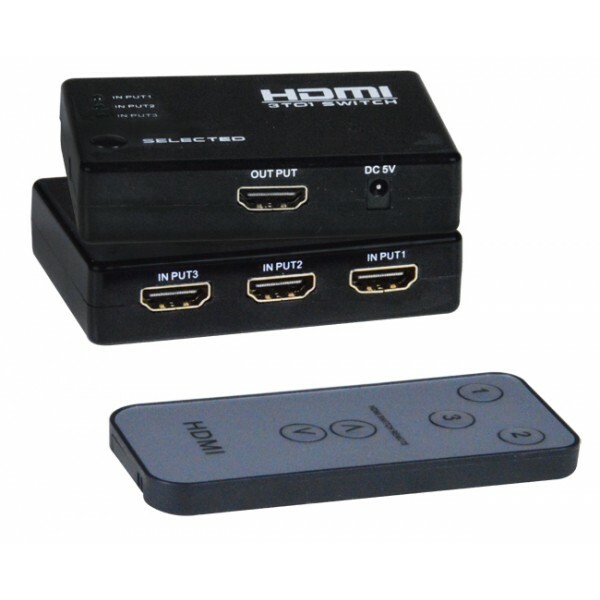 Ideal solution for connecting multiple HD media devices such as video game consoles, media PCs, set top boxes, DVRs, DVD players etc to your home theater systems. SE-HD-3-LC can be powered by video source. Input: Female HDMI Type A connectors. Output: Femalea HDMI Type A connector. Top panel button with LED indication of port selection. IR remote control for each port selection. Front panel button with LED indication of port selection.